Nine entries in the banana pudding bake-off. 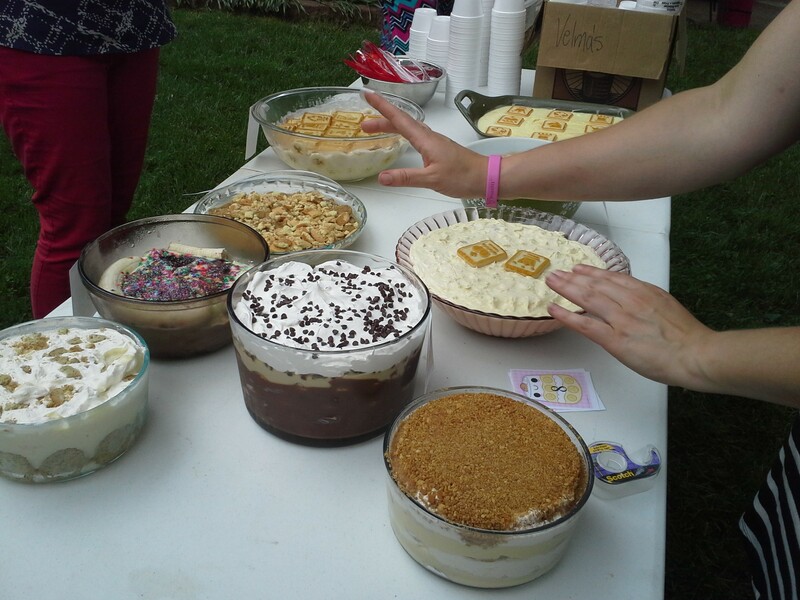 It seemed like a joke — a birthday party/backyard barbecue/banana pudding bake-off? So many slashes, so much to wrap my head around for one afternoon at my friend Christine’s house. Nine bakers made their version of banana pudding. All the dishes were numbered so guests didn’t know who made each entry. Then, everyone scooped and ate to their heart’s content. Right as our bellies were about to burst, we wrote the number of our favorite entry on a slip of paper. The number with the most votes was the winner. Somehow, this amalgamation of an event I attended last week not only worked, but stands out as one of the best parties I’ve attended as an adult (because honestly, nothing competes with some Chuck E. Cheese action as a kid). Kudos to Christine (with 502 Social — contact her for all your event needs!) for introducing a food competition to my sphere of gatherings. A good ol’ fashioned cooking contest makes a party more fun. Guest participation? Check. Prizes? Check. Free, homemade goodies? Double check, underline, bold, italicize. Choose a food that can have a bunch of variations. Though they share the same DNA, banana puddings are not created equal (but they are all created DELICIOUS). There was a chocolate entry, one with rainbow sprinkles, one with meringue, and some with those Pepperidge Farm Chessmen cookies instead of the Nilla Wafers. My world expanded, and I shall never be the same. Pick a dish with wide appeal. Now, everyone didn’t like banana pudding. But enough people at the party were keen on this dish to make it a real competition. You don’t have to please everybody, but you probably won’t make friends with a sardine-sandwich contest. Don’t get too fancy. Whatever you decide to focus your contest one, make sure it’s something an amateur cook or baker can tackle in his or her kitchen. If I have to buy a pizza stone, you’ve gone too far. Keep your surroundings in mind. For the banana pudding bake-off (or make-off, since most entries weren’t baked), we needed plenty of refrigerator space to keep the goodies cold and only brought them to a table in the backyard for judging. As the summer wears on, keep cold dishes for inside parties. Have some prizes. You don’t need a garland of roses. Pick something inexpensive and related to the competition. 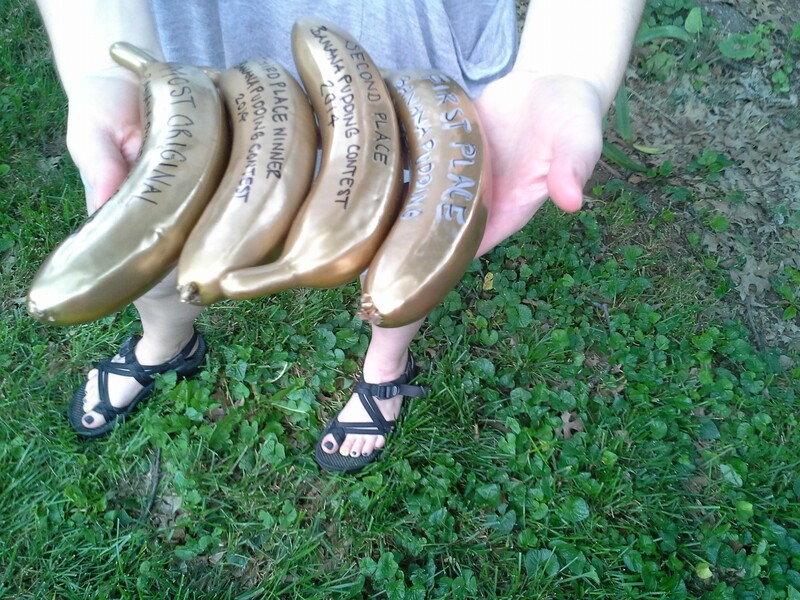 For example, Christine had some nifty fake bananas spray-painted gold and a certificate for the winner. Consider beverages. The internet has given me many gifts, some of which include a boatload of sangria recipes. Find a drink that can be made by the pitcher or punch bowl, with our without alcohol. How about lemonade, or margaritas? Keep it friendly. Yes, this is a competition. But the most important part of adding food as a focal point at a party is the fellowship that comes when a bunch of people are standing around eating, talking and having a good time. At the banana pudding contest, I learned the merits of using real pudding versus instant, what happens when a child decides to “help” cook and creates her own tasty variation, and just how often you can include liquor in banana pudding (answer: a lot). What food (or beverage) competition would you like to participate in this summer?